Harry was born in Loughborough on 24th March 1877. He was part of a large family – there were 10 children in total – and they lived in what must have been very ‘snug’ accommodation at 32 Russell Street, Loughborough. Harry left school and, by the age of 14 was already out at work, working in a local hosiery factory. At the age of just 15 years, Harry decided to enlist in the army, joining the Leicestershire Tigers Regiment. In order to join up, he pretended to be 18 years old. This was the start of a long and eventful military career for Harry. Harry was sent with the Leicestershire Regiment to fight in the Boer War in South Africa. Whilst there, Harry’s battalion, the 1st battalion of the Leicestershires, was sent to Ladysmith, where the locals were under siege. The town was relieved, and Harry volunteered to be a stretcher bearer. Later in the Boer War, Harry was sent to fight at Spion Kop, where he was taken prisoner. Spion Kop was the scene of one of the most violent and deadly battles of the Boer War. It was a defeat for the British Army, and resulted in many deaths. Harry spent 3 or 4 months as a prisoner in Pretoria. Amongst other British prisoners with him at the time was a certain Mr Winston Churchill. Amidst all the confusion of war, Harry was reported killed in action and a memorial service was held for him at Holy Trinity Church, Loughborough. The reports of Harry’s death were, as they say, ‘grossly exaggerated’ and sometime later Harry turned up safe and well. Harry was awarded the South African Campaign medal. He was discharged from the army in 1904, but re-enlisted in 1914 at the start of World War 1. On 18th September 1914, Harry became a private in the Leicestershire Regiment once again. In January of 1915, he was promoted to Lance Corporal and sent to fight in France. Harry fought with the Leicestershire Regiment in France but later in 1915 he fell ill. His service record mentions his illness but does not go into detail. However, according to the Leicestershire Regiment’s records, Harry became ill after being gassed. Never one to be kept down, Harry recovered sufficiently to join the 17th Field Ambulance in France. At the end of October 1916, he was sent to Calais to be returned to England. The following month, he was discharged from the Army. Harry was awarded the Star, British War and Victory medals for his WW1 service. In 1921, Harry re-joined the army, enlisting to do 90 days with the 5th Leicestershire Regiment. In actual fact, he served for a year. Once Harry left the 5th Leicestershire Regiment in 1922, he found work with the Loughborough Corporation – which later became Loughborough Town Council and is now Charnwood Borough Council. 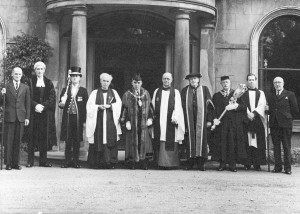 Harry was appointed official mace-bearer for the Corporation and Keeper of the Town Hall. 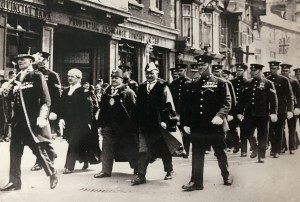 Both appointments involved many official, ceremonial duties, and he could often be seen at the head of mayoral parades in the Town. Harry served under many mayors of Loughborough. In 1943, Harry decided to retire from his position. His last official duty was at the Wings for Victory ceremony, which took place at Loughborough College in the summer of 1943. Local newspapers carried articles about Harry’s retirement. All remarked on his upright and smart appearance, and on the dignity with which Harry had carried out his duties. Harry married Florence Bassford on 12th November 1904. They made their home at 111 Storer Road, Loughborough. The couple went on to have 5 children: Lillian, Ivy, Dorothy Mary, Henry and Joyce. Henry, their only son, (also known as Harry) served in the First Army in World War 2. Harry continued to live in Storer Road after his retirement in 1943. He died in Loughborough in 1968, at the age of 91 years. 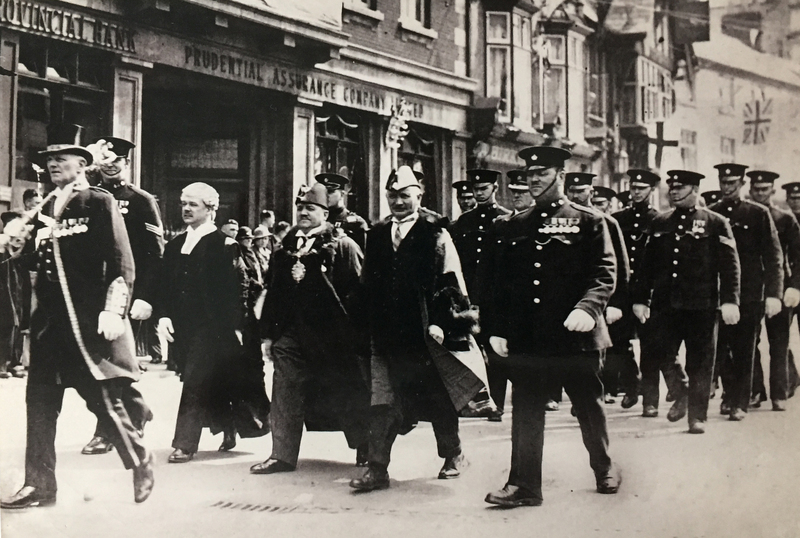 A photograph of Harry leading a parade through Loughborough, sent in by his great-nephew Paul Fairbrother. 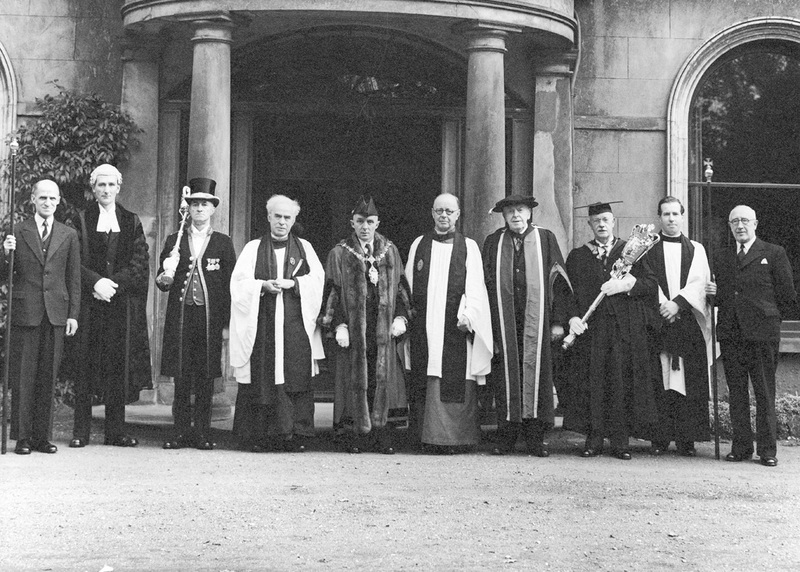 Harry supporting the mayor as Macebearer during the College Sunday event in 1950.